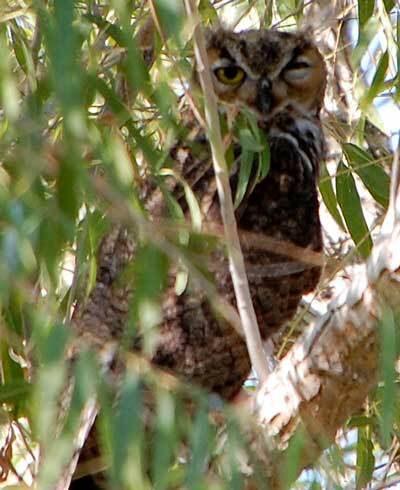 This Great-horned Owl helps keep feral cats under control at Gilbert Water Ranch, Maricopa, Co., Arizona, USA. Nov. 2009. It is seeking some shade and shut-eye in a Goodding's Willow tree. Great-horned Owls are common birds in many habitat types across North America. They are even frequent inhabitants of cities including the cities of the Sonoran Desert where they can sometimes prey on stray pets such as house cats. Although largely nocturnal they are also frequently about at dawn and dusk. Large owl with a pair of horn-like crests on the head and large yellow-iris eyes. In December 1989 I collected eight pellets from Great-horned Owls in the McDowell Mountains. Pellets are regurgitated material from prey that is indigestible. Upon dissection under a microscope I found small mammal bones, but also a large number of chelicerae (fang-like mouthparts) belonging to tarantula spiders. This partly explains the success of these owls in so many habitats: they can capture and eat a very wide variety of prey.